"Set your sights on Meaford"
In addition to the town of Meaford itself (44°36′N 80°35′W), the municipality also includes the communities of Annan, Balaclava, Bognor, Centreville, Leith, and Woodford. In 1837, when this area was part of the St. Vincent Township, locals asked the government for a piece of land at the mouth of the Bighead River. The first settler was from Ireland, before the townsite was laid out by Charles Rankin in 1845 and called Meaford. By then, a sawmill and gristmill were already operating nearby; the post office there was called St. Vincent. Meaford saw little growth until 1850 but then began booming; it had a library by 1856. The post office was renamed Meaford in 1865, after the birthplace of John Jervis, 1st Earl of St Vincent, for whom the township of St. Vincent is named; by then, the community was booming and had connection by steamship and roads with the railway at Collingwood. The community became a town in 1874. In 1872, there were six churches; the railway arrived at Meaford, serving its population of 1700. By the early 1880s, Meaford boasted three planing mills, three carriage factories, two tanneries, a sawmill, a shingle mill, a woollen mill, two foundries, two flour mills, a dozen general stores, and a wide range of other stores and tradesmen. The community also had ten hotels. A public school was added in 1868 with 152 students within a year. A high school was opened in 1890. 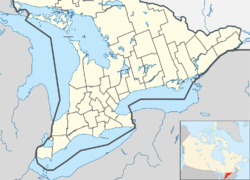 In 2001, with the amalgamation of various municipalities in Southern Ontario, St. Vincent Township, Sydenham Township and the Town of Meaford, were amalgamated to form one municipality entity. Sydenham Township named in part for Lord Sydenham, governor of Canada from 1839 to 1841. St. Vincent Township was named after the Earl of St. Vincent and Meaford was named after his stately house. A township is an area of land (about 15 miles by 12 miles)that is divided into 100 acre farms (usually). For more than one hundred years the townships of Ontario were municipal entities with an elected council and a reeve. Sometimes a small area of a township was separated and incorporated as a town. The town was then a separate and distinct municipality. This was the case with Meaford in 1874 when it was separated from St. Vincent township. However it ceased to be a town at the time of amalgamation. A transition team preparing for the new municipality voted in September 2000 to name it Georgian Highlands, with the name Meaford ranking second. Highland Hills, Georgian Shores, Bayview, Trillium, Big Head Valley, Georgian View, Cape Rich, Bay Shore Highlands, Georgian Bay Highlands, North Grey and Queen's Bush were other names considered. But the council of the new Georgian Highlands municipality voted 4-3 on 5 February 2001 voted to name the amalgamated area Meaford, citing confusion with nearby municipalities such as Georgian Bluffs and Grey Highlands. A by-law to formalize the name change to Meaford for the amalgamated area was subsequently passed on 5 March 2001, also by a 4-3 vote. Since that time confusion has continued in the use of the name "Meaford". At present the name "Meaford" is commonly used in reference to the urban area formerly known as the Town of Meaford, while the name "Municipality of Meaford" is commonly used in reference to the merged region resulting from amalgamation in 2001. Meaford is on the eastern edge of the Bruce—Grey—Owen Sound federal and provincial electoral district. The town of Meaford is located on Ontario Highway 26 between Owen Sound and Collingwood on Highway 26. A local public transit service makes stops within urban Meaford, but not in Sydenham or St Vincent. Greyhound Canada makes daily schedule stops at the town of Meaford on the route from Toronto to Owen Sound. Local taxis service the area around the town of Meaford. Billy Bishop Regional Airport is located in the municipality on Highway 26 between the Town of Meaford and Owen Sound. The closest post-secondary school is the Georgian College regional campus in Owen Sound, Ontario. Several scenes from the Disney movie One Magic Christmas were filmed in Meaford. The town is served by two community newspapers, the Meaford Express and the Meaford Independent, the latter originally an online only publication, however as of May 31, 2013 and the former being sold and eventually ceasing publication, is available both online and in print. CKNX-FM, originating from Wingham, Ontario to the south, has a low-power retransmitter on 104.9 FM to serve the municipality. Meaford is otherwise served principally by media from nearby Owen Sound. Rogers cable is available in the Town of Meaford while residents in the former St. Vincent and Sydenham have access only to Satellite TV. Keith Bissell: composer, conductor, and music educator (1912–1992). John Muir, naturalist, author, "Father of the (U.S.) National Parks", left the US to avoid conscription during the Civil War and lived in a cabin near William Trout's mill, where he was working, in the Bighead Valley near Meaford during 1864-1866. ^ a b "2011 Community Profiles". 2011 Canadian Census. Statistics Canada. July 5, 2013. Retrieved 2012-03-15. ^ "Census Profile 2016; Meaford (Municipality)". Census 2016. Statistics Canada. Retrieved 22 November 2017. ^ "Our History". www.meaford.ca. Retrieved 19 October 2017. ^ "Historical Plaques of Grey County". www.waynecook.com. Retrieved 19 October 2017. ^ "Mary Williams Trout: Diaries of a Small Town Lady | Grey Roots". greyroots.com. Retrieved 19 October 2017. ^ Woodhouse, Scott (2000-09-13). "Georgian Highlands selected as new name". The Meaford Express. Archived from the original on 2007-10-09. Retrieved 2008-01-19. ^ "2016 Community Profiles". 2016 Canadian Census. Statistics Canada. February 21, 2017. ^ "2006 Community Profiles". 2006 Canadian Census. Statistics Canada. March 30, 2011. Retrieved 2012-03-15. ^ a b Fell, Chris (2000-11-15). "Gerald Shortt elected first Mayor of Georgian Highlands". The Meaford Express. Archived from the original on 2007-10-09. Retrieved 2008-01-19. ^ "Conmee Family Photo Gallery". 2007-12-19. Retrieved 2008-01-19. ^ "Biographies: Lloyd, Marshall Burns". mlloyd.org, sourced from Who's Who in America, 1926-27. Retrieved 2014-05-10. ^ "John Muir's Wild Years - Mountain Life". Mountain Life. 21 July 2015. Retrieved 19 October 2017. ^ Mather, Dave. "John Muir in Canada". www.meaford.com. Retrieved 19 October 2017. Wikimedia Commons has media related to Meaford, Ontario.